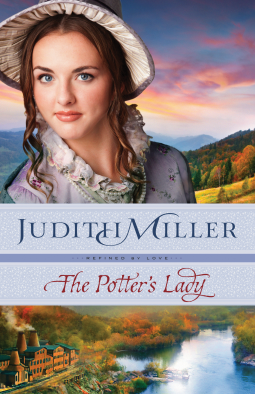 I enjoy collecting transferware pottery so reading The Potter's Lady by Judith Miller was fun in many ways. Young Rose McKay, fresh from design school is home long enough to help her brother decide on a new family business. Written out of the original family brick making business by a conniving aunt by marriage, the family purchases an ailing pottery business in hopes of turning it into a profitable enterprise. Rose is wooed Joshua Harkness, son of a family friend who is managing his father's pottery. He is quick to offer his help to turn the business successful, while seemingly able to spend much time away from his own business affairs. Rylan Campbell seemed to be heir apparent to the ailing pottery and through the goodness of the McKay family continues to work at the pottery upon their purchase. He is slow to trust Joshua Harkness and wonders how his business continues to thrive when McKay Pottery is losing business reasonable contract bids. He has his suspicions but can he prove them? Rose and Rylan collaborate on a design project that could secure the business of all Franklin Hotels. The contest has two distinct design projects that require them to work together for the good of the company. Determined to win the contest and Franklin Hotel's business, they run into a few snags that may take the prize just out of their reach. The story is engaging and gives you a glimpse into an industry that seems to be lost in our country today. Artisans worked on lovely pieces for the home that have been passe down through generations. We take this work for granted when we can purchase things online or at the big box store. But just over a hundred years ago, people depended on these factories for their livelihood. I applaud the author for her research and for an engaging story. This is my first book by this author and she didn't disappoint. I could clearly see the old cabin and wondered about the tales it could tell. The careworn items and souvenirs waiting to be packed up to be sold captured the imagination of what might have been. The stories of Jess, and her grandmother are deeply entwined with missing links of days gone by spent at the family cabin on Lake Charlevoix in Michigan. Richly steeped in history, Jess's inherits the cabin on the death of her grandmother and returns after seventeen years to dispose of the contents and sell the place. I could feel the leather of beaded moccasins, and see cobwebs left abandoned in a lonely unused 113 year old cabin. Nora Carroll is an accomplished author who develops rich characters who stand alone or with each other as they each toggle the pages between past and present. The beauty of the lake bears a great sadness for her family. Her grandmother still dressed for dinner every night as though they still had their meals at the club. Jess is left to her devices during the day as long as she is ready for dinner. Forbidden love, loss and the constant beauty of the lake and the woods made this a wonderful book for my vacation reading list. I was caught off guard a few times and this kept me coming back for more. Life at the lake in the 1920's was so different than walking the beach in flip flops and shorts. Bathing dresses, etiquette and carrying on with the right sort of people was the norm. As Jess sorts through the cabin, reading journals and looking at photographs, she discovers the truth of who she is. These glimpses into her grandmother's life as a girl and later a young woman put her on a collision with the life she knew. I recommend this book if you like a mystery that keeps you thinking and begs the questions that often are swept under the rug. I could share so much more but you have to read the whole book to enjoy all of Jess' story. Through Waters Deep is my first foray into pages written by Sarah Sundin and it was not a disappointment. I love American History and the time leading up to World War Two was one time our country desperately needed to come together. The world was a scary place and our countrymen were at odds with each other over deep political views. Europe was at war and England needed our support. Wary of getting into another war, isolationist and interventionist points of view created dangerous partnerships as new ships were being built in the Boston Navy Yard. Mary Stirling, secretary extraordinaire quietly saw to the details of the launch ceremony of the Ettinger and noticed there was something amiss with the foil on the bottle of champagne. Had she read too many Nancy Drew novels in school or was something going to happen. A near miss encounter with gasoline substituted for champagne sets the stage for our quiet, unassuming heroine who would just as soon stay in the background than avoid all the clues of sabotage she stumbles onto. Ensign Jim Avery, a familiar face from back home in Vermilion, Ohio is also on the platform waiting to see the ceremony for the Ettinger. Mary spotted him but was pretty sure he wouldn't remember her, the girl always in the shadow of others. As fate would have it he sees her and remembers her as the sidekick of his former high school crush. She remembers much more....but as one who was always content to be in the background, it is a step out of the comfort zone to play tour guide to Jim, his buddy Arch and his glamorous girlfirend Gloria. Events at the Naval Yard puts Mary in an interesting position where she sees a lot, hears a lot and has a nose for clues leading to the resolution of developing sabotage. I have to bite my tongue or in this case, watch my keystrokes to keep sharing some spoilers. The story is lively, refreshing and full of the hopes and dreams of the young men and women in one of the scariest times in our country. We know the outcome of the war but not the names of the saboteurs and their motives. The ensuing love story is one that stretches Mary and Jim, making them become stronger in ways that only a developing war surrounding them could bring forth. I recommend this book for the wonderful characters and a plot that had me going almost until the end! I am looking forward to the next two books in the Waves of Freedom series Anchor In The Storm and and The Face of The Deep. I could hardly put this book down. I love suspense novels and in my opinion award winning author Patricia Bradley can write a plot that is unpredictable. Gone Without a Trace is no exception. The story is book three in the Logan Lake series and includes characters from Promise To Protect and Shadows of the Past. Livy Reynolds, a homicide detective from Memphis is taking a little time off after a shooting incident. Enter handsome Dallas Private Investigator Alex Jennings and you do have some predictable sparks of romance. That is where the predictability stops. Alex is searching for the granddaughter of a Texas State Senator and Livy believes there are similarities between the case of Samantha Jo Woodson and the sudden disappearance of her cousin Robyn two years ago. Both cases involve waitresses working in diners. In both cases, the victims are warned to quit their jobs from cryptic notes. The two are joined together in the hunt to find similarities to these cases and other cold cases that involve waitresses who left without a trace. So many things run through my mind in a mystery, like trying to figure out who the perpetrator is and remembering clues that lead to solving the case. Patricia is particularly good at developing complex plots that keep me on the edge of my seat. This book is for the reader who likes complex characters and a plot that thickens right up to the end. I recommend this book to you and I guarantee that one quick look on page one and you will be flipping to page two as though you were reeled into the story.